Tired of looking through tons of listings? Do you need a specific type of home or dates? We are a local family owned company, Exclusive Properties, located right here on Isle of Palms. We specialize in beautiful, luxury or budget friendly vacation rentals and can help you find the perfect home. We are familiar and live in the area and will make the process as easy as possible. Just call or email us and one of our friendly vacation specialists will get back to you right away. 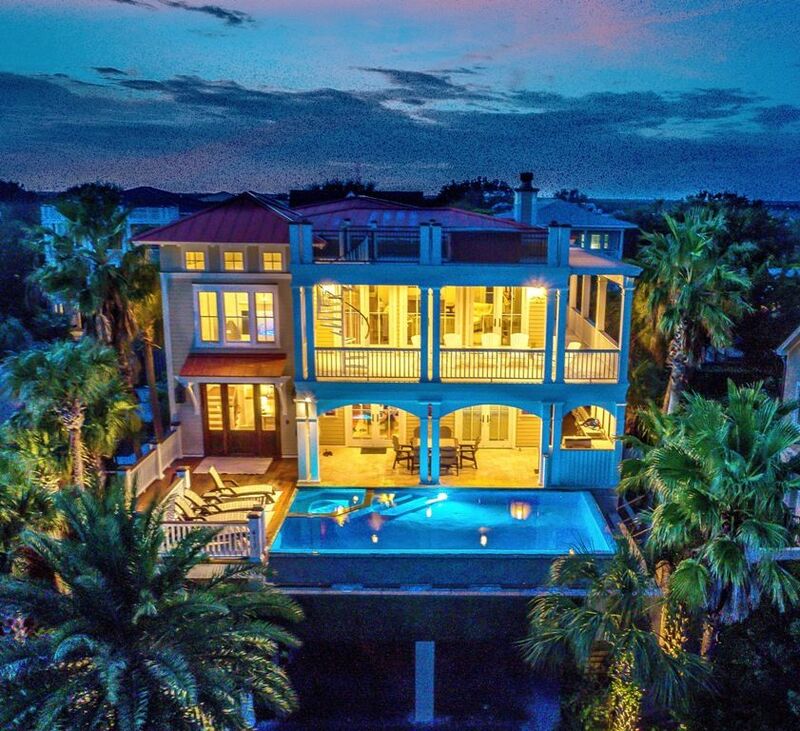 'Ocean View', is a seven bedroom, six bathroom (two half), 4,000 square foot vacation home that offers guests the finest in luxury amenities. Among 'Ocean View's' opulent, luxury features are its three sided infinity edge pool (heatable for a fee), glass elevator, 750-gallon aquarium, rooftop deck, hot tub and Viking stainless steel appliances. 'Ocean View' is situated in an ideal location directly across from the beach on Ocean Boulevard. From the large wrap-around porches or widow's walk, you can take in the ocean breezes from just across the street. The "front beach" downtown area of Isle of Palms is just 5 blocks away. Our homes come with a check out clean and linens for each bedroom. You will also have the chance to purchase additional bath towels and purchase beach towels after you reserve. The kitchens are equipped with all of your cooking essentials. You just need to bring the food. We can also arrange to have the kitchen stocked with food before you arrive. Just ask us for details after you book. We offer travel insurance to all of our guests through Red Sky. Red Sky specializes in the Isle of Palms area and covers you in the occurrence of a mandatory evacuation, medical emergencies, loss of a family member, loss of job, etc. The cost is about 7.25% of your rental cost. Please email for exact cost. We recommend getting travel insurance through us. Each reservation is charged a $1,000 refundable security deposit. The security deposit will be run in the week leading up to your arrival, and will be fully refunded within 30 days of your departure after we have inspected the home for any major damages. Sometimes this is done and returned quicker than 30days. This security deposit is not included in your quoted rate on VRBO/Homeaway. IOP has the nicest beach in the Southeast. Charleston is just minutes away and consistently ranks as one of the top 5 cities in the country according to Conde Nast. Gorgeous Home. 750Gallon saltwater aquarium, infinity edge pool, no home obstructing ocean views. Very quiet street. Upscale decor, and appliances. You will love our home and we are happy to talk to you about it. toilet, shower, jetted tub, Located on second living floor in Master Bedroom. toilet, combination tub/shower, Located on first living floor in king bedroom. toilet, combination tub/shower, Located on first living floor in queen bedroom. toilet, combination tub/shower, Located on first living floor between two king bedrooms. toilet, Located on first living floor by bunk bedroom. toilet, Located on second floor by queen bedroom and kitchen. Beautiful home and excellent follow up and service by exclusive properties. We were very pleased with our experience! Gorgeous house with great access to the beach and the city. The property was so very nice and comfortable!! Our group of 12 were all extremely satisfied. Exclysive properties was top notch!! Three generations gathered for a long weekend reunion recently. The house was perfect. It had everything we could have asked for. Everyone commented on how comfortable the beds were, and the furnishings were top notch. Easy access to the beach was important to us, and the property delivered. Megan and her team were wonderful to deal with. Loved the house. Kitchen had everything we needed to serve Thanksgiving dinner for 22! Pool was wonderful and warm with the heat turned on. Promixity to Ocean was perfect! Exclusive Properties was easy to work with and very accommodating.